okay the photos have been re-uploaded. THE ONLY WAY I was successful in having the PC detect the box in USB Burning Tool was to join the two pins on the nand. pins to another component on the board using an ohm meter. I installed a push switch permanently. This way I never need to open the box again. Please be sure you know what you are doing. If your board is NOT the same as the one in the picture I would not recommend you try this. DO SO AT YOUR OWN RISK!!! Here are some more photos showing the serial connection and my alternate connections for joining the two pins on the nand. I had to glue the very thin wires down so they would not rip the tracks off the board! It's seems litte tricky, but will see what I can do, sorry if I missing something but the red wire, is it already in box or? Help me guys, here it's pitcure of my hardware, it's seems not the same with yours, Wich pin is it, can you market it to me? Thank you. Saved my device. Ok guys, I am hoping one of you can help me out. I have a OTT MXQ box. 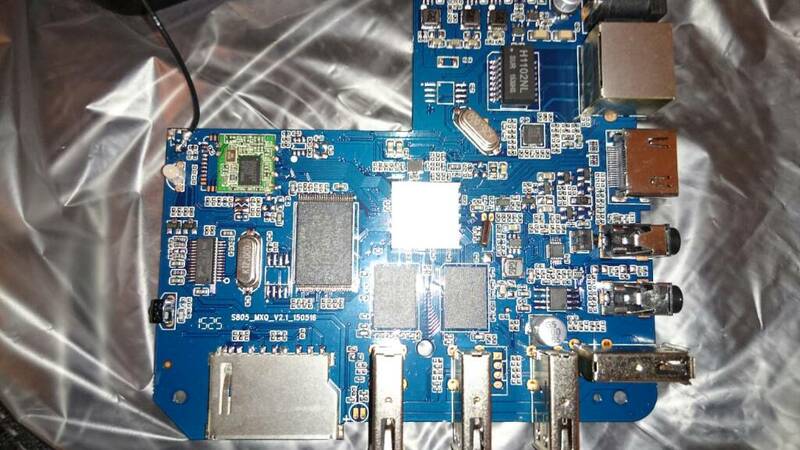 The board is stamped "S805_MXQ_V.2.1_150516". I have shorted pins 17/18 on the NAND chip and can get USB Burning Tool to recognize it. I have tried to load the recovery image from 20150129.rar, the rom image from MXQ_110k4_20150325.img and the AML_upgrade_package from S805-1023.rar. No joy on any of these. All of them fail/error/timeout around 3-4%. I really need to get this box fixed. okay here is a more detailed picture. are actually connected to the correct pins on the nand. Your board/nand may be different!! (in case the wire is pulled) and possibly lifting the pad off the board, rendering the board useless! The pad is very small and the solder does not hold very strongly. until you let go of the switch. Hold the switch in until you hear the USB detect sound from your computer. I mounted the switch on the LH side of the box so I can use it another time if needed (see picture). Remember I am not responsible if you destroy your board!!! If your board is not 100% like the picture then don't do this!!! Last edited by ckeays; 01-02-2016, 05:25.
there is a solution somewhere, do some googling. Remember the importance of installing the switch!! more than one time because the pads on the boards will lift, rendering your board useless!! The pins only need to be joined until the computer (or usb burning tool) detects the board. After that it should program, and your board is fixed. Last edited by ckeays; 01-02-2016, 05:38. All times are GMT-8. This page was generated at 16:08.